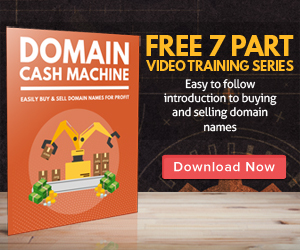 “Domain Flipping” has become a tremendously popular way of earning money. Everyday people are buying and selling domain names they think will have strong commercial appeal. Sometimes domains have just the right sound, sometimes they have consistent traffic, and others have great content and products. The key is to find a good name and move on it … before someone else does. What makes a good domain name? It helps when it relates to a popular trend like music, games, or movies. The domain name speculator must be careful, though, to avoid any domain name that could be considered a trademark or copyright infringement. If they fail to heed the warnings, they’ll usually find themselves on the short end of a lawsuit and lose the domain name and a lot of money in the long run. One of the easiest ways to make money with a domain is to generate consistent traffic. If the domain name has a popular, generic sound to it, it’s quite possible it may generate a lot of type-in traffic. Type-in traffic is when surfers simply type a common word or phrase directly into their web browser. Now you may assume that most people use search engines to find what they are looking for, but a recent UCLA study reported 86% of online consumers reach websites though type-in navigation. will reveal a vast list of domains available for purchase, usually at huge multiples of the original cost. Domains they were originally purchased by a savvy investor can be sold for over $500.00 in three days or less. And at larger domain auction houses such as Moniker.com, the best domain names available can fetch upwards of $50,000.00. In fact, in early 2007, this auction house sold NewYork.info for $70,000.00 and Travel.info for $116,000.00. A good domain name doesn’t have to end in .com anymore either. With the increasing diversity of domain name extensions and the growth in the wireless market, domain name extensions seem to matter less and less. So if you want to get in while the going is good, start brainstorming domain names, and maybe you’ll be the next person to flip a million dollar domain name.